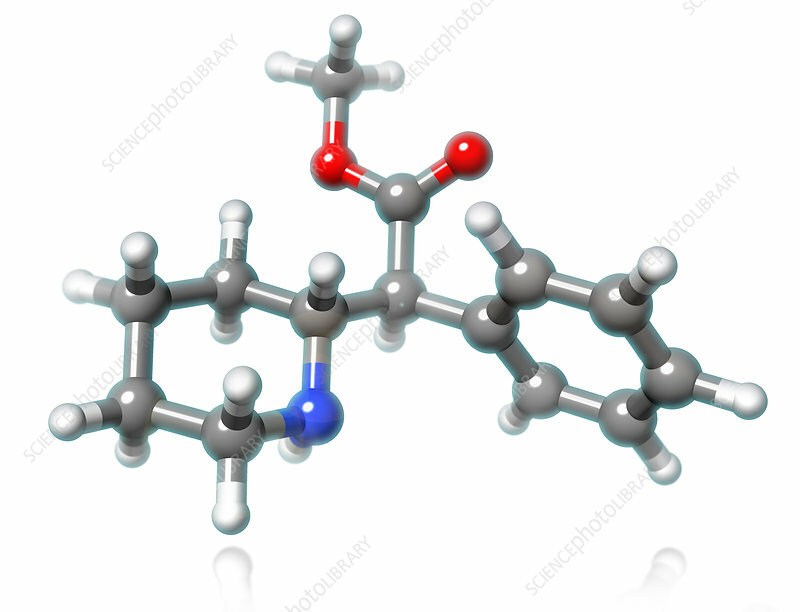 A molecular model of methylphenidate, a central nervous system stimulant used to treat attention deficit hyperactivity disorder (ADHD), postural orthostatic tachycardia syndrome and narcolepsy. Ritalin is one of the more commonly prescribed brand names of methylphenidate, and works to increase central nervous system activity and mental alertness. Though more research is needed regarding the long-term effects and dependence of stimulants such as methylphenidate, the most common side effects include nervousness, drowsiness and insomnia. Atoms are coloured dark gray (carbon), light gray (hydrogen), red (oxygen) and blue (nitrogen).